"Here, in this material world, we are put into mṛtatva, subject to birth, death, old age and disease. But there is another position, where there is no birth, death, old age and disease. So which position we should like—birth, death, old age and disease, or no birth, no death, no old age, no disease? Which one we should like? Hmm? I think we should like no birth, no death, no old age, no disease. So that is called amṛtatva. So amṛtatvāya kalpate. Every living being is amṛta (immortal). That will be explained. Amṛta... As we are, in our own original, constitutional position, we are not subjected to birth, death, old age and disease. Just like Kṛṣṇa is sac-cid-ānanda-vigraha (Bs. 5.1), eternal, blissful, knowledgeable, similarly, we, being part and parcel of Kṛṣṇa, we are also of the same quality. The... We have accepted this position of birth, death, old age and disease on account of our association with this material world. Now, everyone is trying not to die; everyone is trying not to become old; everyone is trying not to be dead, meet death. This is natural. Because, by nature, we are not subjected to these things; therefore our endeavor, our activity, is struggling how to become deathless, birthless, diseaseless. That is struggle for existence. So here in the Bhagavad-gītā gives you a nice formula. Yaṁ hi na vyathayanty ete puruṣaṁ puruṣarṣabha. This transmigration of the soul, one which is not afflicted by this, dhīras tatra na muhyati (BG 2.13), one who understands... Suppose my father dies, if I have got clear understanding that 'My father has not died. He has changed the body. He has accepted another body,' that is the fact. Just like in our sleeping state, dreaming state, my body is lying on the bed, but in dream I create another body and go, say, thousand miles away in a different place, as you have got daily experience. Similarly, the gross body being stopped, I, as spirit soul, I do not stop. I work. My mind carries me. My mind is active, my intelligence is active. But people do not know that there is another, subtle body, made of mind, intelligence and ego that carries me to another gross body. That is called transmigration of the soul. Just like Kṛṣṇa is ādi-puruṣa, the original person. 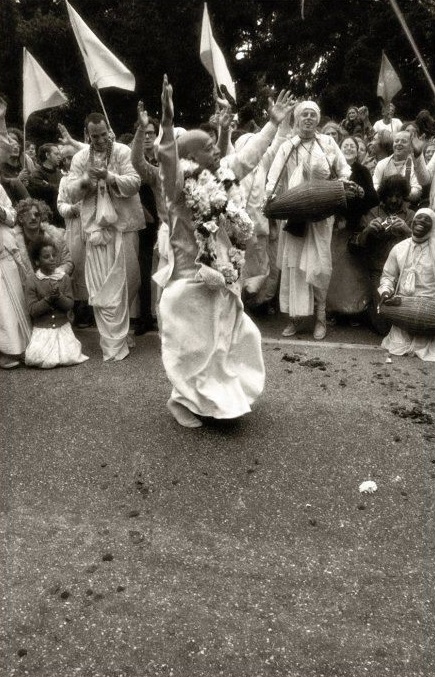 Still, you'll find Kṛṣṇa always a young man of sixteen to twenty years' age. You'll never find Kṛṣṇa's picture as old. Nava-yauvana. Kṛṣṇa is always nava-yauvana. Advaitam acyutam anādim ananta-rūpam ādyaṁ purāṇa-puruṣaṁ nava-yauvanam (Bs. 5.33). Ādyam, the original person, and the oldest; at the same time, He is always in youthful life. Ādyaṁ purāṇa-puruṣaṁ nava-yauvanam. In another place, Bhagavad-gītā, therefore it is said, brahma-bhūta (BG 18.54), 'One who has understood Brahman,' prasannātmā, 'he's always joyful. He's not disturbed by these material condition.' That is here stated: yaṁ hi na vyathayanty ete. These different transformation, different changes of nature, body and everything, one should not be disturbed by all these things. These are external. We are spirit soul. It is external body, or external dress that is changing. So if we understand nicely, na vyathayanti, and you are not disturbed by these changes, then saḥ amṛtatvāya kalpate (BG 2.15), then he's making progress, spiritual progress. That means, spiritual progress means, he's making progress towards eternal life. Spiritual life means eternal, blissful life of knowledge. That is spiritual life."